Astronomers are going for the brass ring this time. Using a technique called nulling interferometry, they hope to be able to find the first Earth-like planet orbiting a star. The Very Large Telescope Interferometer, an array of telescopes in Chile, is being outfitted with PRIMA, a nulling interferometry device. This device combines light from different telescopes for incredible resolving power; it should be able to see a quarter on the Moon. The technique was first suggested for use in looking for Earth-like worlds by Australian-American astronomer Ronald N. Bracewell in 1978. In two-mirror interferometry, light is collected from the star and is then combined using secondary optics in such a way as to put the light from one mirror exactly half a wavelength out of step with light from the other, causing the light from the star to cancel inself out. However, light from the region surrounding the star, like a dust cloud or even an Earth-like planet, is not canceled out, and becomes visible. "PRIMA will revolutionize exoplanet detection and our understanding of other solar systems," said Fred Kamphues, a telescope expert at Dutch company TNO, which built a key part of the device called the Star Separator. "I think that with the planned new facilities and future observatories under study, it is quite likely that we will find extraterrestrial life within the next 100 years," Kamphues said. 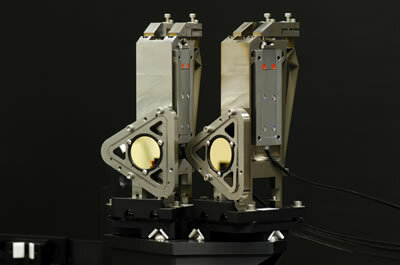 The VLTI, which is run by the European Space Agency, will be the most effective small-planet hunting telescope on Earth. The VLTI's four large telescopes have mirrors that are 27 feet across. Update 31-Jul-2016: Read about Edmond Hamilton's search for habitable planets from his 1936 short story Cosmic Quest. End update.